Bio: Redd Pepper is one of the UK’s best loved and most prolific voiceover artistes. Known as 'Mr Movie Trailer Man' from the sheer number of Hollywood blockbusters his voice has trailed, Redd has gone on to establish himself in other areas and he’s now best known for his appearances co-presenting TV shows including ITV’s ‘The Nightly Show’ and starring in TV campaigns for ‘Compare The Market’ and ‘VW Golf’. His latest voiceovers include ad campaigns for big brands including, ‘Virgin Media’, ‘Kelloggs’, ‘Tesco’ and ‘Persil’. Tim Burton cast Redd to voice ghouls for ‘Mrs Peregrine’s Home For Peculiar Children’ and most recently he voiced ADR characters for ‘Mary Poppins Returns’. He continues to regularly voice promos for ‘Disney', 'Channel 4', ‘ITV' and the ‘BBC'. 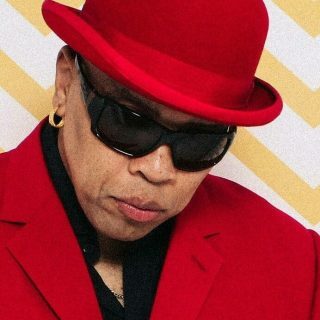 Redd has been a special guest on TV shows including the ‘BBC’s Pointless Celebrities’, ‘Eggheads’ and ‘Never Mind the Buzzcocks’ and presents his own jazz, funk and soul radio show on JSFR. Description: A living legend! Big, booming, deep, gravelly, majestic American voice. One of the UK's most prolific voice over artists delivering effortless Barrie White tones to the classic Hollywood Trailer VO. Redd's also very adept with Jamaican accents, plus a great cockney read! Whether you need an epic movie trailer voiceover or characters for an animation or video game Redd can deliver!